This week I'd been fighting off some sort of sickness and finally had to give in on Friday and take a day off from work to rest. I literally did not move from the couch all day and Ryan had to drag me out (for my own good) on Saturday for brunch. By the time Sunday rolled around, sure enough, Ryan had gotten sick too. 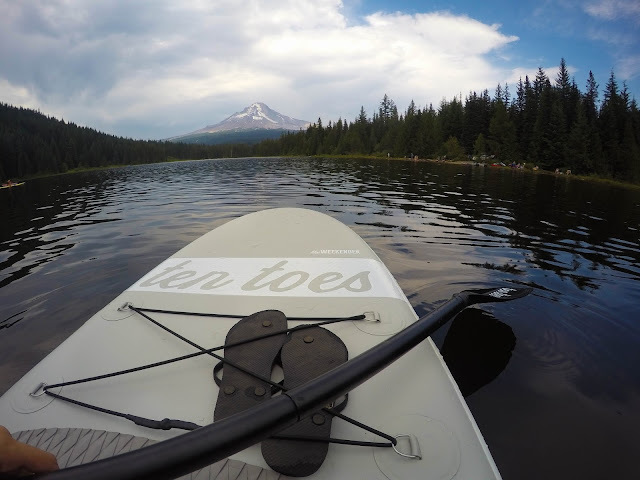 However- we'd promised Ryan's mom some time on the water and couldn't go back on our word so we all hit Trillium Lake for an hour or so to test out her new kayaks and my new Ten Toes Paddle Board. I started paddle boarding when I lived in Austin, on Lady Bird Lake. Since then, I've loved paddle boarding, but never owned my own board. Ten Toes sent me The Weeekender and couple weeks ago and I finally got to test the waters. 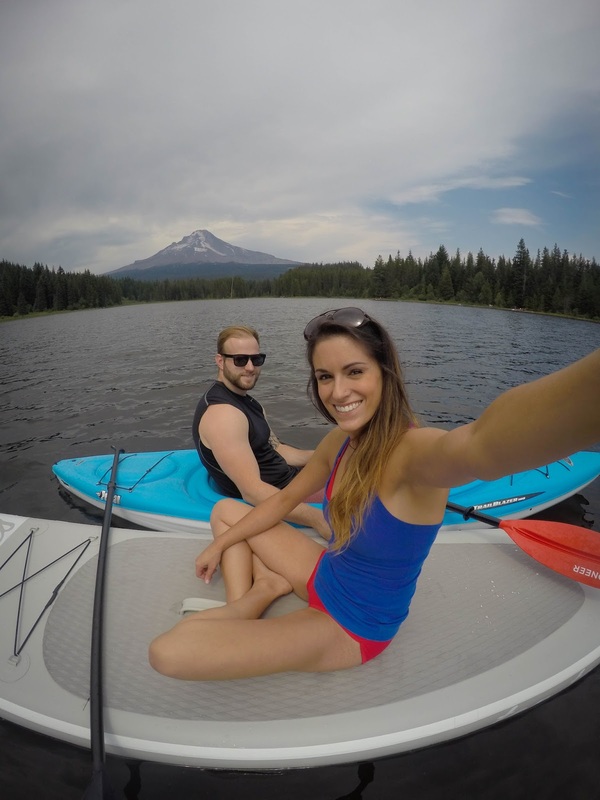 I've never paddled on an inflatable board, but I'm sold! I will admit, there wasn't much standing up this time around (because I still felt like I'd been hit by a bus and had a head full of snot), but it was fun. 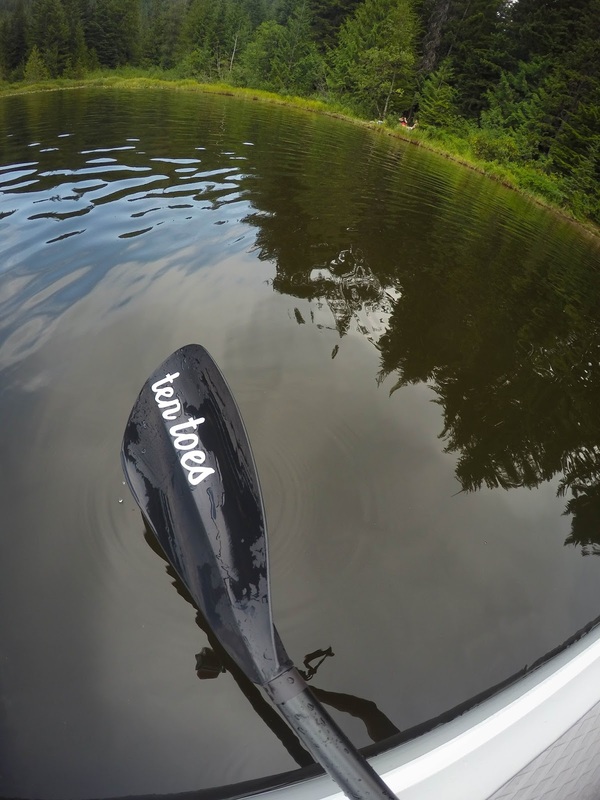 Tip: If you're not comfortable standing all the way up on you board, try paddling from a mid-kneeling position. This won't work your core as much as standing up, but your quads will be screaming! 1. Unroll the paddle board. 5. Get in the water! There was a bit of worry at first that because the board was inflatable, it wouldn't be as stable, but it was totally fine! Silly as it may sound, but the best part of this board is the bungee cord at the front. It was a lifesaver that held my flip-flops and kept my GoPro from falling the water when I wasn't using it. Can you tell we both need Mucinex and a nap?! Disassembly of the board is just the opposite- remove the fins, deflate, throw in the car! I recommend either fully drying the board off once you get home or letting it dry (unrolled) in your garage overnight before rolling up and putting away. If you have any questions, feel free to leave them in the comments below! 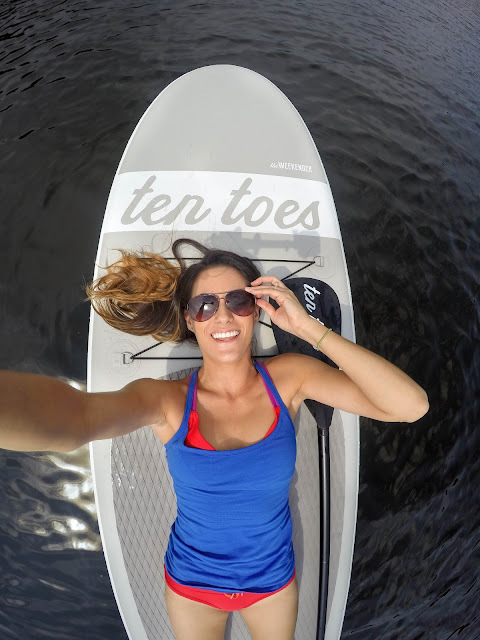 Thank you Ten Toes for sponsoring this post!